Detention theatrical release! Find it near you! James is currently starring in a play called “The Birthday Present 2050” at the Skylight Theater in Los Angeles. 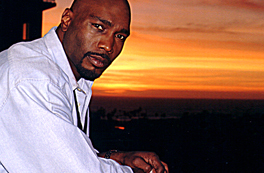 Look for Love Chronicles 2: Secrets Revealed with Vingh Rhames and Vivica Fox in your video store now. James stars as a crazy gym teacher in the new movie directed by Joseph Khan, Detention, with Dane Cook. Also, this season you can catch James on the hit series Burn Notice (USA Network) as the Haitian mobster, Jean Claude Duman. Later this month, keep an eye out for James on Criminal Minds (CBS). This fall look for James in an action thriller called Three Days Gone. As reported in Variety Magazine, James has been added as a series regular to the new show “Fashion House” which begins filming this month and can be seen on the new Fox channel this spring. “Fashion House” stars Bo Derek and Morgan Fairchild.